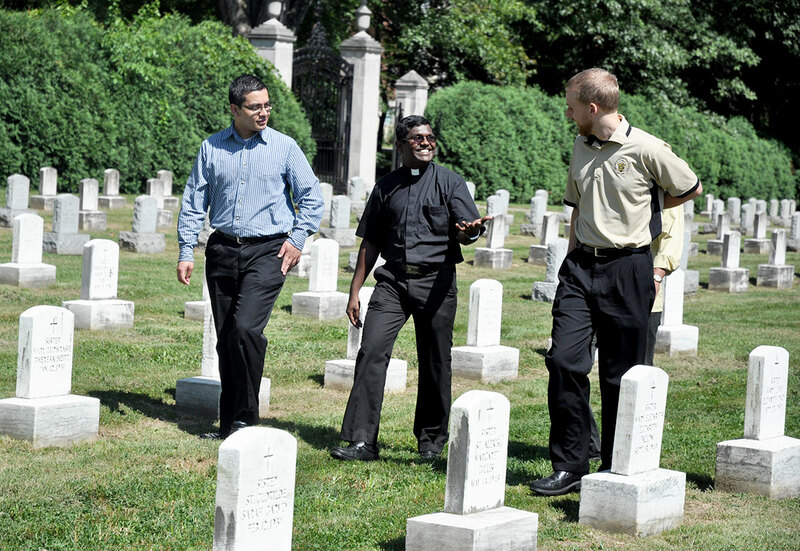 ST. MARY-OF-THE-WOODS—History and holiness came alive for the seminarians of the Archdiocese of Indianapolis when they visited the motherhouse campus of the Sisters of Providence of Saint Mary-of-the-Woods on Aug. 14. They saw the place where St. Theodora Guérin and her companions first set foot on the grounds that would become the home of their fledgling religious order. They visited a replica of the chapel where Mother Theodore, after arriving in western Indiana in 1840, prayed before the Blessed Sacrament. They also came to the current resting place of Mother Theodore, a shrine within the Church of the Immaculate Conception, the motherhouse’s main church. Seminarians, sometimes by themselves, sometimes in groups of two or three, silently prayed before the mortal remains of Indiana’s first saint, sometimes kneeling before her casket, other times touching it with their hand. McKinley, a member of St. Christopher Parish in Indianapolis, is a freshman at Bishop Simon Bruté College Seminary and Marian University, both in Indianapolis. The pilgrimage capped off the annual three-day archdiocesan seminarian convocation in which men in formation for the priesthood for the Church in central and southern Indiana spend time together, before going off to their seminaries for the upcoming academic year. Six years ago, transitional Deacon Daniel Bedel visited Saint Mary-of-the-Woods on a seminarian pilgrimage when he wasn’t too far ahead of where McKinley is at in his priestly formation. Now he is just months away from being ordained a priest. As he drove a van of seminarians to Saint Mary-of-the-Woods, he reflected on how this was his final seminarian pilgrimage. Part of that preparation for the priesthood is spending summers in archdiocesan parishes. Deacon Bedel, a member of St. John the Evangelist Parish in Enochsburg, ministered for 10 weeks at St. Mark the Evangelist Parish in Indianapolis. But spending time with his fellow seminarians at the convocation was also important for Deacon Bedel. Spending time with his brother seminarians was important for first-year seminarian Jeff Dufresne, a member of St. Monica Parish in Indianapolis. Accompanying the seminarians on the pilgrimage was Father Eric Augenstein, who began his ministry as archdiocesan vocations director earlier this year. He was excited to welcome eight new seminarians, six of whom will receive priestly formation at Bishop Bruté Seminary. 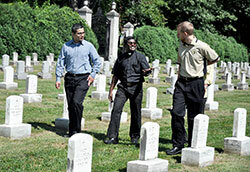 The other two are enrolled at Saint Meinrad Seminary and School of Theology in St. Meinrad. He also noted that nine of the archdiocese’s 11 deaneries are represented among the 27 seminarians. No matter where the seminarians come from, Father Augenstein hopes that they all grow in holiness during their years of priestly formation. During a Mass celebrated in the Church of the Immaculate Conception, Father Augustein standing just a few feet away from the mortal remains of St. Theodora reflected on striving for that sanctity.